Pallikaranai marsh, a bio-diverse ecosystem has turned out to be a garbage disposal site for south Chennai. 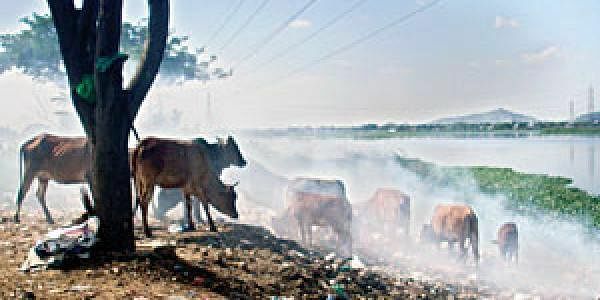 Cows grazing in the midst of smoke from burning of garbage in the Pallikaranai marsh. CHENNAI: Pallikaranai marsh, a bio-diverse ecosystem that houses 106 species of birds, 46 species of fishes and 29 species of grass, has turned out to be a garbage disposal site for south Chennai, as the civic body’s dumpyard has been eating into the land for the past few years. The marsh that originally covered an area of 5000 hectares had shrunk into 593 by 2002. On the other hand, the corporation’s dumpyard that was 56 hectares in 2002 had gobbled up a sprawling 136 acres in 2007 and is on constant expansion. Over 4,500 metric tones of garbage are dumped here from south Chennai every day. Besides, lorries from other parts of the city drop industrial waste in a heap along the water bodies. A national level study on the Wetlands of Tamil Nadu under the Ministry of Forest and Environment in 2002 stated that there was a 90 per cent loss of habitats. The study attributed the loss to ‘Purpose determined by the State’. “Though the ground water level is high, the water cannot be used due to its bitterness,” Ramachandran, a resident of Pallikaranai lamented. Also several studies found considerable levels of mercury and cadmium in the water. After a wave of protests in 2007, the government designated 317 hectares of the marsh in the southern part as a reserve forest under the Forest Act. But no efforts on conservation have been made and things are getting worse day-by-day, locals say. This dumpyard was originally allotted 19 acres in Sevaram village at Perungkudi in 1970. By mid 1980, the area was completely filled up and then the corporation shifted to the present location in Pallikaranai. A Pallikaranai protection committee comprising government stakeholders submitted a report to the civic body three months ago suggesting shifting of the dumpyard.